The TC-L32B6 is the second of only 2 32 inch models for the 2013/14 year. 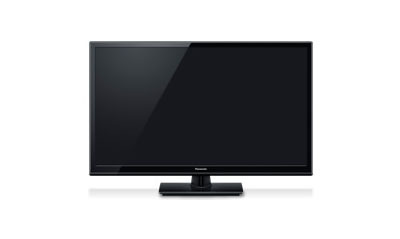 The 32 inch version of the B6 series lost some of the best picture quality features its 39 and 50 inch brother have. The 1080p display is the biggest difference here. The 1080p might not be as important on a TV this size but the hit in viewing anlges is certainly felt. There is an IPS LED panel here that isn't seen on the larger sizes. This gives the 32 inch size a boost in side viewing angles and color reproduction. All in all, this is a perfect budget model ideal for a second room, office, or kid's room. Energy Star 6.0 certification is missing here too. None of the advanced picture quality features are offered on the TC-L32B6 that are found on the larger sizes in the series. It is about as basic as it gets. The 720p spec may seem like a bad quality in a sea of 1080p televisions, but the picture is really not so bad. In fact, most broadcast and cable programming comes into your house at 720p or 1080i. In reality the B6 is going to be used at its full potential rather than down scaling most of the programming you watch on a 1080p set. On the flip side, as a computer monitor it is not going to work so well. The B6 series has the slim design of all the LEDs in the lineup for the year. The slim design makes for a very thin profile typical of LED backlit TVs. That feature helps to make this budget model look a bit more advance. The glossy black bezel is nothing to be impressed with, but it's not terrible. The stand is similar to the XM6 series without some of the width. Overall, the TV looks quite nice but it won't be the talk of the town. Dimensions without stand (W x H x D): 29.2" x 17.8" x 3.1"
Dimensions with stand: 29.2" x 20.3" x 7.3"
Weight without stand: 14.3 lbs. Weight with stand: 15.4 lbs.